MSRP excludes the Delivery, Processing, and Handling Fee of $920 for Cars (Yaris, Yaris iA, 86, Sequoia, Sequoia HB, Sequoia, Sequoia HV, Prius LB, Prius c, Prius Prime, Mirai, Sequoia, Sequoia HV), $1045 for Small/Medium Trucks, SUVs and Van (C-HR, RAV4, RAV4 HV, Sequoia, Sequoia HV, Sequoia, Sienna, Tacoma), $1,295 for Large SUVs (Sequoia, Land Cruiser), and $1,395 for Large Truck (Tundra). (Historically, vehicle manufacturers and distributors have charged a separate fee for processing, handling and delivering vehicles to dealerships. Toyota's charge for these services is called the "Delivery, Processing and Handling Fee" and is based on the value of the processing, handling and delivery services Toyota provides as well as Toyota's overall pricing structure. Toyota may make a profit on the Delivery, Processing and Handling Fee.) Excludes taxes, license, title and available or regionally required equipment. The Delivery, Processing and Handling Fee in AL, AR, FL, GA, LA, MS, NC, OK, SC and TX will be higher. The published prices do not apply to Puerto Rico and the U.S. Virgin Islands. Actual dealer price will vary. 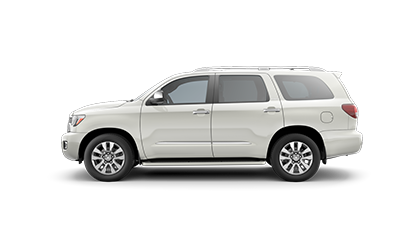 $500 rebate offered by Toyota Motor North America, Inc. and may be applied toward finance or lease contracts on new Toyota vehicles, dated from 12-04-2018 and01-02-2019. To qualify for the rebate, at the time of purchase or lease you must (1) be in current active duty status in the U.S. military (Navy, Army, Air Force, Marines, National Guard, Coast Guard and active Reserve) OR a U.S. military inactive reserve (i.e., Ready Reserve) that is part of the individual Ready Reserve, Selected Reserve and Inactive National Guard; OR a military veteran or retiree of the U.S. military within one year of their discharge/retirement date; OR a household member of an eligible U.S. military personnel, including Gold Star family members; AND (2) provide verifiable proof of military status or active service; (3) receive a salary sufficient to cover ordinary living expenses and payment for your new vehicle; and (4) receive credit approval from and execute a finance or lease contract through a participating Toyota dealer and Toyota Financial Services. Not all applicants will qualify. On lease contracts, rebate must be applied toward the Amount Due at Lease Signing or toward the Capitalized Cost Reduction. On finance contracts, rebate must be applied toward the Down Payment. Limit one rebate per finance or lease transaction per eligible U.S. military personnel or eligible household member. Offer not combinable with the College Graduate Rebate Program, the iFi Program, and the Lease-End Refi Program. Vehicle must be taken out of dealer stock. Terms, conditions and restrictions apply. Program is not available in AL, FL, GA, HI, NC, and SC. Rebate terms may be more generous in your local area. Ask your participating dealer about the military rebate terms in your area. Must pay sales tax. Void where prohibited by law. Not redeemable for cash. Toyota Financial Services is a service mark of Toyota Motor Credit Corporation (TMCC). TMCC is the authorized attorney-in-fact and servicer for Toyota Lease Trust. ©2018 Toyota Financial Services. All rights reserved. Toyota Financial Services is a service mark of Toyota Motor Credit Corporation (TMCC). TMCC is the authorized attorney-in-fact and servicer for Toyota Lease Trust. Built in collaboration with the team at Toyota Racing Development (TRD), the Sequoia TRD Sport features LED headlights, a gloss-black grille with chrome surround, 20-in. black alloy wheels and a TRD-tuned suspension. When you look this good, it's okay to show off a little. That's why Sequoia TRD Sport rides on bold 20-in. alloy wheels with a black-accent finish. Second-row passengers get first-class amenities. Second-row climate controls allow for fine adjustment of the weather inside, regardless of the climate outside. Three 12V auxiliary outlets help keep everyone's favorite portable devices powered up. Plus, Platinum's rear-seat Blu-ray Disc™ entertainment system features a rear 120V AC power outlet, so you can power your need for your video games, laptops or almost any other device. Take in more of the world with Sequoia's one-touch tilt/slide power moonroof with sliding sunshade. Imagine your passengers looking up and seeing the treetops of a tree-lined drive to the country, or a sky full of stars driving through a desert night. The moonroof doesn't just open up the cabin-it opens the entire experience. Refined engineering. Brute strength. Proven capability. With Sequoia, you set the soundtrack for your adventure thanks to a USB port that enables iPod® connectivity and control. There?s an auxiliary input jack for other music players, and the available system also features Bluetooth® hands-free phone capability and audio streaming.